The best pointer to the success of a business trip usually comes when the weary traveller flops down amidst piles of notes and brightly headed press releases to the chorus of cynical colleagues asking, "had a good holiday boy ?" Persuading those who had to look after some of your business, as well as their own, that you really did accomplish something worthwhile is relatively easy, so long as the enthusiasm generated in those hectic days lingers on. A poor trip from the journalistic viewpoint is swiftly dismissed lathe words, "It wasn't really worth doing ... there's nothing to write about. .. just a 'jolly' really." Just as difficult, and it is the situation I find myself in for this Swedish report, where so much has happened which has been enjoyable and interesting, that one risks one's audience retreating into slumber while faced with such a barrage of enthusiasm. Simply, myself and a colleague from Motoring News spent a long weekend in Sweden as the guests of Saab, visiting their competition department and attending a round of the Swedish Rally Championship. I found myself intrigued by an approach to motor sports that is uniquely based on constant managerial support for the task of turning in some amazing performances from products that look so much more staid than their opponents. Packed into the schedule arranged by the most efficient PR man I have encountered, Mr. Torsten Aman (a former rally co-driver with the legendary Carlsson and others), were such tasty ingredients as: a chance to look around the 190 horsepower turbocharged derivative of the ageing Ford V4 engine, and the recently-developed 2-litre, d.o.h.c. motor of 16 valves, derived from the s.o.h.c. Triumph-canted power unit. Having appreciated the work that goes on in the competitions centre, I went on to sample the results via rides in the forest with the factory driver, Stig Blomqvist. That skilled exhibition was followed by driving both the bulbous 96, with its invaluable freewheel, to the smoother 99EMS prepared to a Swedish adaptation of FIA Group 1 regulations. While Blomqvist went to weekend in Holland to contest a rallycross in the turbocharged, 13 cwt., lightweight version of the Saab 96, I had a swift glance at the company's museum and then set off for a weekend of rallying in Per Eklund's rallying 99EMS with that gentleman, who is Blomqvist's freelance team-mate and the winner of this year's Swedish Rally. After a full weekend's viewing, our hosts thoughtfully arranging their 99EMS' unfortunate retirement in time for an evening meal, we returned to Gothenburg with the courageous Per Inge Walfridsson, who had just turned in a hard-fought class-winning performance, despite the memory of a previous weekend curtailed within the blazing Chequered Flag Stratos. Formed in 1950, the competitions department grew within the engineering department as the brainchild of Volvo's current engineering chief, Rolf Melde. 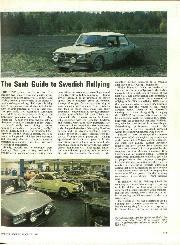 Almost inevitably some of the best known Saab competition drivers were actually first employed by the company as test drivers, including Erik Carlsson and Carl Magnus Skogh. 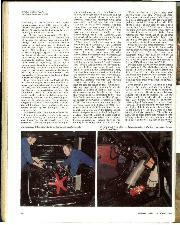 As part of engineering, competitions tended to get a lot of people within the company thoroughly involved with their activities, and there were a number of interesting projects authorised during that period, including an open version of the Sonnet sports car and the weighty but accelerative F3 car powered by that amazing two-stroke, three-cylinder DKW-inspired unit. In January 1962 Bo Hellberg joined the company as competitions manager, reporting to Rolfe Melde, but beginning to give the department a separate identity as the engineering staff had enough work of their own to do in developing the V4 successors to the two-stroke range. For a while in 1963 the department used a building that is wryly described as "like a British racing shop", so it is no surprise to be shown later that tin hut sitting in the middle of a field! 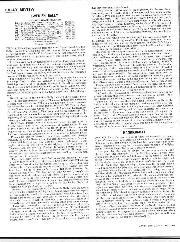 Within the company changes began to occur in competitions ownership, for the department, which had already won them three consecutive RAC Rallies (Carlsson, of course), the European Rally Championship and both 1962/63 Monte Carlo Rallies, had now passed into the responsibility of the public relations division. By 1964 "baby Bo" Swaner had arrived and, in the same way as Hellberg, this talented organiser and former competitor is still with the company. In normal outside company terms Swaner is the team manager on a dayto-day basis, while Hellberg deals with the increasingly complex politics of modern motor sport, including his activities as a CSI committee man. The department is tightly staffed for the activity engaged in. Half-a-dozen men operate within the neatly arranged workshops under foreman Paul Broman, while four more build the V4 and slant-four derivatives of production Saab engines, which are used in competition under the supervision of Lars Jahnsson. Considering that the factory programme includes winning the Swedish Rally Championship (which seven-round series Blomqvist has already conquered) and contesting the European Rallycross Championship, plus selected events such as the International Welsh, Finnish 1000 Lakes and RAC Rallies, it is hardly surprising to hear that more men are to be drafted into the department shortly. One very interesting aspect of the Swedish Rally Championship series is that the modified cars that comply roughly to pre-1976 Group 2 specification are dying out rapidly as a breed, replaced by Standard A and Standard B classes catering for cars homologated in FlA Group 1 (more than 5,000 units a year). Attempting to compete production cars is normal enough today, but the Swedes have arranged things so that the cars have very similar power-to-weight ratios. Effectively this means the Standard A class is particularly hard-fought with the VW Golf, Kadett GT/E, Volvo 242 and Toyota C.elica ranged up against the Saab 96 EMS machines from the works (Per Eklund/Bjorn Cederberg) and Saab's very active Sport and Rally Division, the customer outlet for competition parts and cars. Different marques have special dispensations to enable competitors to get round most of the basic rallying weaknesses apparent in mass-produced vehicles intended for family use, but the basic thinking is that the cars should be strong enough for privateers to run (so some body strengthening is permitted), suspension changes of shock-absorbers and dampers are permitted, as is the installation of a limited slip differential. While Saab may have inherent body strength, they have needed to extract the maximum possible power from the engine. So the blueprinted 135 b.h.p. 2-litre (that is roughly 17 b.h.p. more than standard) breathes better via a new camshaft, and the power is more effectively relayed through a non-synchromesh gearbox, containing larger straight-cut gears. Currently the works have four main themes to their conversions. The 96 V4 in carburated 1,993 c.c. trim can give 170 b.h.p. in Group 2 trim and this is the weapon Blomqvist has used with such success in and out of Sweden for so many years. Weighing just under a ton the 96s use a tremendous number of standard Parts, but their days are numbered even within Sweden, as the later 99 and the passage of time begin to make it look obsolete. For rallycross the 96 loses a quarter of its weight and develops 190 b.h.p. at 7,000 r.p.m. There is a single 175 Stromberg CD to pass the mixture to an Air Research turbocharger, set to give between 0.9 and 1.2 atmospheres of boost for a motor that presently displaces 1,784 c.c. (the latter boost figure would give more like 240 b.h.p. but the car is not so reliable). Aside from gutting the interior to a series of thin metal strip panels and a single seat in front of the large steering wheel (a turbocharged front-drive car is recommended as a lot more fun than keeping fit via the Bullworker exercise system) the rallycross cars are distinctively equipped with 13 in. diameter is/Unlike magnesium alloy wheels. Normally Saab have their own 15 in. diameter wheels installed for all forms of competition, but the British wheels allow them to lower the gearing, the car, and fit specialist Dunlop tyres that mix racing profiles and widths with rally traction patterns. Both Blomqvist and Eklund regard the 96 Turbo as something of a beast. Heavy steering and poor starting-grid manners ensure that it is an exacting task to overtake the opposition within the sub-5-mile distance provided in most rallycross heats. The 99 comes in two basic forms as well. First there is the painstaking strip down and fiddling approach to ensure the best possible example of a 99 EMS is turned out for Standard A competition. Then there is the fully modified version of the same car with the 16-valve engine. The modified engine has been developed rapidly (work started June last year) and as simply as possible. Basically it consists of a standard lower half to the engine, utilising the production cylinder block, connecting rods, crankshaft and bearings. No longer are these parts directly inter changeable with the Triumph Dolomite slant-four engines, from which the Saab unit originally sprung, for the Swedish company went through an intensive development programme when they enlarged the unit from 1.8-litres to 2-litres in 1972. Our hosts laughingly recalled that all the engine work had been the responsibility of people who normally deal with the successful Saab Scania trucks, and that kind of massive strength is certainly evident on the current production cylinder block. In competition terms this means that Saab have been able to make the best possible use of the extra breathing capacity offered by the four-valveper-cylinder arrangement, realising a current output of 220 horsepower from 7 to 8,500 r.p.m. at present. In the future the factory expect to increase peak power beyond 240 b.h.p. These are significant figures that British Leyland would dearly love to have present in their troubled TR7s, for the Triumph cylinder block has shown itself incapable of absorbing outputs much beyond 180 b.h.p. Even the hitherto totally reliable Group 1 racing Dolomites from Broadspeed have suffered engine problems this season, so there obviously are big differences between the two superficially similar units today. Saab have already had the first rewards of their new power unit. Following FIA homologation in October, when the necessary 100 sets of parts to convert a production engine into the competition 16-valve layout had been completed (a homologation process that is no longer possible under the 1976 FIA Group 2 regulations, so Saab had to be swift to benefit) the 99EMS scored an outright win on Belgium's Boucles de Spa in February. The new engine did give trouble in the Welsh International, but we will definitely see it in action again on this year's RAC Rally, the EMS being the model for rallying and promotion outside Scandinavia. Looking around the engine shop it was obvious that in the areas of cylinder-head port design, camshaft profiling (either from Cosworth or a Swedish supplier so far) and fuel supply, the latest Saab engine is still the subject of much experimentation. Both Lucas fuel injection and twin Weber 48 DCOE carburetters have been assessed on the Gunnar Axelsson head design, with injection initially proving more powerful. The head itself is a two-section design, the top half devoted to camshaft carrying duties. In Saab's engine shop they grin easily over the memory of their first encounters with the Ford V4, which gives 65 b.h.p. in standard trim, and which Ford Cologne Competitions had abandoned at 93 b.h.p. 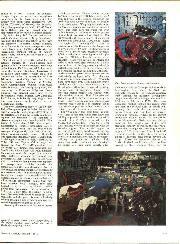 Saab did succeed in pushing the engine all the way up to 175 b.h.p. with Lucas injection, but that was really too much, for the production-based bottom end and the cylinder head-block relationship was distinctly strained at that stage. I drove the kind of 160-b.h.p., twin Weber 45 DCOE carburated example that has provided many Scandinavians with winning transport to an international level, and found it the car with more character than any other marque rallying today. The freewheel takes a little getting used to at first. Once mastered the steering-column gear-change can be rowed straight from 1st to 4th, all without clutch. Just how useful this is to the left-foot-braking technique of Blomqvist was dramatically demonstrated when we went out together in the non-freewheel 99EMS. 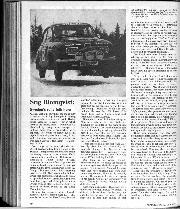 Covering forest track at a rate that feels perceptibly quicker than even his most talented rivals can offer, Blomqvist still had major difficulties in engaging gears when changing down from 4th to 3rd and, particularly, 3rd to 2nd without the clutch; on the 96 this process is easily accomplished at high speed. View out from the 96 is almost VW Beetle in character, but you learn that those small windows and thick Swedish steel are almost tailor-made for rallying's apparent affinity for lurid brushes with such solid wayside objects as trees, stone walls, cliffs, and so on. The acceleration is quoted by the manufacturers as occupying seven seconds to progress from a standstill to 62 m.p.h. ; the turbocharged rallycross car is reportedly two seconds faster than that, which puts it firmly into the ranks of exotic cars, so far as normal road-going machinery is concerned. What is more important to the driver is a constant supply of torque allied to a reasonable body weight, an adequate disc-drum braking system and stiffer, though again very much production-based, suspension. Acceleration between 30 and 90 m.p.h. is good on the road, and at least as good as most more powerful rivals on the loose. Both the 99 and 96 are at their most competitive when faced with stages where speeds drop little below 50 m.p.h. and do not exceed 100 m.p.h. ; partly because the drivers are such hard-chargers and also because the cars respond well when their power-to-weight penalty has been removed. The 99 in which I sat alongside Blomqvist seemed very comfortable and stable compared with the stubby 96, though its larger dimensions and tolerance of travelling crabwise to the direction intended, make any ride through trees memorable. The engine produces its power well from the peak torque at 5,500 r.p.m. and the noise levels are a little more subdued than the opposition, presumably because of the car's civilised 21 cwt. bulk. The 99 I drove shared a lot of the suspension, braking and slight body strengthening changes of the more powerful car. The biggest noticeable difference came in the roll cages, the Eklund Group 1 car having a simple hoop instead of the comprehensive screen pillar and rearward tubing of the 220-horsepower model. Both had four-speed, non-synchromesh gears with the production casing—all the remaining saloon-car opposition tend to have five-speed ZF of West Germany units—and I noticed that Eklund needed to concentrate quite hard in order to achieve clean changes. When you mix in the "emissions camshaft", a special profile that delays power delivery below 5,000 r.p.m., but then delivers the goods until 7,200 r.p.m., the Group 99 becomes as hard as many far more radically modified cars to drive. 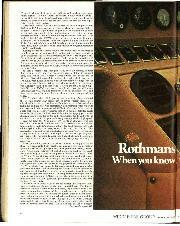 All of the EMS specification 99s have Bilstein shock-absorbers, but as from the 15th of January the settings were stiffened, following a test session that included Ronnie Peterson (a loyal Saab user in Britain) as well as the rallyists. For competition a further 20% stiffening in response to the shocks of rallying is required. The result is a car that is still obviously front-wheel-drive on slow corners, but exhibits little emotion when competently tackling faster curves. The brake servo is ingeniously boosted by a vacuum pump taken from a milking machine! This unlikely transplant has allowed the brake pedal to stay instantly available at the top of its travel, saving split seconds in reaction time that can be very important when faced with an unexpected rallying hazard. It was interesting to note that Pirelli CN36s, just like the original equipment supplied on many modern sporting cars from Ford, Opel and VW, are often used for the soft, smooth Swedish variety of special stage rallying. The aluminium wheels on which they rest look similar to the Saab optional devices, but they are actually lightened a little by scalloping out some of the solid areas in the production design: just as with Minilites tales of strength abound for these wheels, including 22 kilometres covered by Mr. Blomqvist with no tyre on the rim. Acceleration with 135 b.h.p. substituted for 118 in a vehicle weighing comfortably over a ton is not startling, but there is a very firm push forward as you utilise each gear to the maximum. The car will pull quite flexibly in the normal way, but there is a hole in the delivery of energy between dawdling and flat out, so the camshaft change is only really desirable for rallying. Maximum r.p.m. came very swiftly in fourth gear (not much over 90 m.p.h. on the revised gearing), but this competition car was almost restful at a constant 70 m.p.h. and 5,250 r.p.m. At this pace one can snuggle gratefully into the Recaro driving seat, hold the Motolita leather rim wheel lightly and persuade oneself what a cushy life these factory drivers enjoy. Those simple sentiments were soon dispelled by a spell viewing the High Chaparral Championship rally. Based upon the extraordinary artificial American ranch/Dodge City replica of the same name, the rally demonstrated very effectively how interest has swung dramatically from comprehensively modified competition cars to the simpler vehicles contesting Standard A and B categories. From a British spectator's viewpoint the cars are a little less spectacular in action than can be seen on a home Championship event, but there is an enormous variety of vehicles. We actually saw only two Fords competing in Sweden, which seems strange reward for the effort that company put into their rallying activities with a Scandinavian emphasis. At least the cars are driven in true Viking style! My more experienced companion thought the standard in Britain at least as high as was demonstrated on the Swedish event. 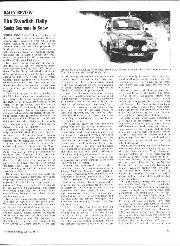 From that viewpoint it was interesting to note that Bror Danielsson, who won the High Chaparral outright in his Group 1 Standard A Kadett GT/E after the demise of the more powerful cars with whom he had been scrapping, later came to the Scottish Rally and found it hard to make an impression on the leading British Group 1 exponents, eventually finishing third in class. Truly the advent of Roger Clark in the British series has raised our standards beyond expectations, though there is still nothing to be smug about at the very top. What the Swedes do get is very good rallying value for money. 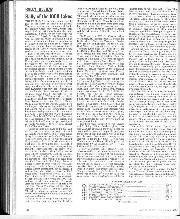 Owing to sponsorship the cost of entering the High Chaparral had been restrained to £50, for which competitors covered 175 stage miles, with little of the boring road link sections that so often have to be a feature of British events. In fact my companion drew the comparison between this Swedish event and the Welsh International this year, which had about the same stage mileage at considerably higher cost: the Welsh was also at least 100 cars short compared to this Swedish national event! So far as the actual stage performances were concerned I thought that the Swedes generally showed more bravado about speeding flat-out over blind crests. Also, there were some exceptional night stage miles covered by the smaller-engined cars battling for a class win, which was eventually decided by 8 seconds in favour of Walfridsson's Volvo-DAF 66. My last miles in Sweden were covered along dirt roads with Mr. Walfridsson driving his five-speed Volvo 264, trailer full of spares and little yellow rally car. The sun shone, dust and stones flew, Sunday drivers cowered in the hedge as the Volvo and trailer slid gracefully from one right angle application of opposite lock to the other. Even though I couldn't navigate on a map designed for tourists, and the clutch broke, the aftermath of a weekend spent among the people who showed Britain what special stage rallying was all about lingered on. 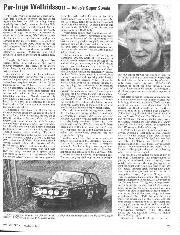 As our Volvo thundered south, with the conscientious Mr. Eklund driving his short-wave radio-equipped Saab along in convoy behind, I could not help smiling at the thought of these two highly skilled rally drivers being dubbed by the general press media as part of a dour nation of suicidal alcoholics. They, like the hundreds of other enthusiasts associated with rallying in Sweden, just enjoy doing, or seeing their sport as the best pastime in the World.